Trailer - Gollywood, Here I Come! Before writing children's books, Terry John Barto directed and choreographed more than 200 regional theater productions. In addition, he was the creative mind behind numerous television and cruise ship live shows throughout the world. When Terry John Barto was employed as the creative director for Wings of Dreams Productions, he worked with many diverse ideas and turned them into screenplays for animated films. He also used his experience to help artists develop popular action figures and dolls for several large retailers. He lives in Los Angeles, California and enjoys Pilates, Yoga, and hiking with his dachshunds, Hunter and Mazie. 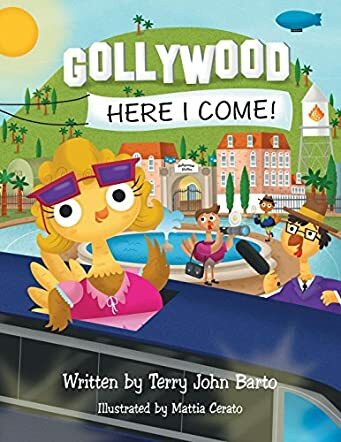 Gollywood, Here I Come! by Terry John Barto is an adorable story with an even more adorable concept of motivating young readers to dream big. Anamazie Marie LaBelle dreams of becoming a Gollywood star and that is always at the back of her mind. Anamazie's dreams come true when she becomes the finalist in Gobbleville's Got Talent contest. Mr. Albright, who is in the audience, thinks she is terrific and asks her to do a screen test. Anamazie is dazzled by the glitz and glamour of Gollywood when she enters the studio for her screen test. Will Anamazie's Gollywood dreams become a reality? Will she be chosen for the role? The story is charming and it not only teaches readers to dream big, but also to work hard towards making their dreams come true. The illustrations are colorful and lively and breathe pace and movement into the characters and story. Anamazie's determination and perseverance to achieve what she wants is inspiring and motivating to readers. The book is a good bedtime storybook and it is also good for read aloud sessions in classrooms and school libraries. Books with a message are good to read because it's easy to make kids understand concepts, ideas, messages and morals through stories. I found the story original and refreshing, and the character of Anamazie is lovable and delightful. Anamazie's journey from that of a small town turkey to that of being a famous child star and an overnight sensation is indeed very inspiring to all readers.